Just in time for the holidays, NASA’s Curiosity rover is celebrating Christmas 2015 at a Red Planet Paradise — remarkable “Namib Dune.” NASA’s Curiosity rover celebrated the event by taking her first ever color self-portrait with the mast attached high resolution Mastcam 34 mm camera. Heretofore Curiosity has snapped color self-portraits with the MAHLI camera attached at the end of the 2-meter-long robotic arm, and also a black and white self-portraits with the mast mounted navcam camera. This new Mastcam color self-portrait was snapped by Curiosity, and comprises the first ever color pictures of the rover deck. Beforehand, Curiosity has used the Mastcam color camera to take several thousands of beautiful high resolution panoramic pictures of the splendid looking Martian land, but not the whole rover deck, which comprises the inlet ports for the pair of chemistry labs in the robot's belly. So, why take a Mastcam self-portrait now? Because there’s exclusive science to be gained from the Red Planet's swirling winds flogging up dust and sand particles with the Curiosity rover now at the brink of the huge dune field at the foothills of Mount Sharp, and also to look for accumulation of particles on the rover deck. 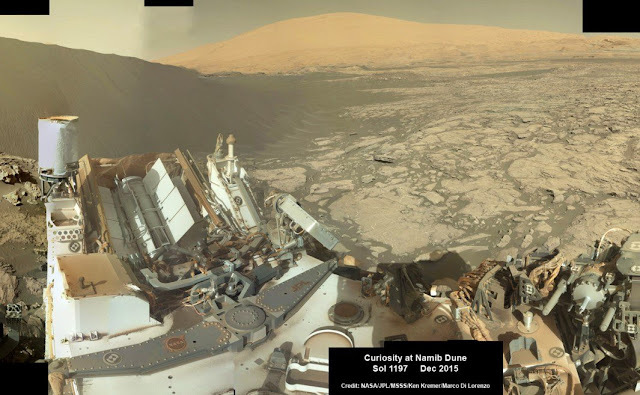 Curiosity reached the outer edge of Namib Dune in mid-December. And as the pictures display, Namib Dune is huge and unlike anything came across before by Curiosity. Namib Dune is portion of a gigantic field of remarkable rippled dark sand dunes, called the “Bagnold Dunes” — situated at the base of Mount Sharp and is nearly two stories tall. The six wheeled Curiosity rover was send off to the dunes to do humanity’s first up-close study of presently active sand dunes anyplace beyond Earth.